At Terezakis and Grieshaber Dermatology our goal is to have your appearance exemplify your inner health and beauty. "Terezakis and Grieshaber: both wonderful! Love this clinic!" "Dr. Grieshaber is extremely smart, thorough and compassionate." "Dr. Terezakis highly knowledgable and clearly an expert in her field." "Dr. Terezakis prides herself on great skin. It's pretty amazing." Terezakis & Grieshaber Dermatology in Metairie, Louisiana, is a premier medical and cosmetic dermatology practice led by world-renowned dermatologist, Dr. Nia K. Terezakis. Dr. Terezakis and Dr. Elizabeth B. Grieshaber offer the most innovative services for diagnosing and treating dermatological conditions with the highest level of patient care. Serving the greater New Orleans area, Dr. Terezakis and her team utilize advanced technology -- including Cutera laser treatments -- to address common to complex skin issues, such as eczema, acne, rosacea, and skin cancer. They also offer customized facial treatments to rejuvenate your skin, giving it a more youthful and well-balanced look. The expert medical team is highly skilled at providing cosmetic treatments, like dermal fillers, Botox®, and microneedling, to improve your overall appearance and self-confidence. TruSculptⓇ 3D body contouring services are also available to help eliminate stubborn fat and redefine body shape. 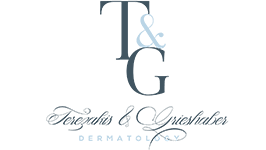 Besides providing advanced dermatology services, Terezakis & Grieshaber Dermatology offers premium skin care products to help maintain vibrant, healthy skin. Available products, like powerful retinol creams, protective sunscreens, and age-defying skin cleaners, ensure skin has the nutrients it needs to look and feel amazing. We accept most major insurance providers. Please contact our office directly with any questions. "Dr. Terezakis and her staff are warm and welcoming. They are all very professional. Dr. Terezakis is a wonderful person and a wonderful doctor." "I am such a fan of Dr. Terezakis. I do not think I could have made it through my teen years without her care." "Dr. Grieshaber so sweet and concerned and very calming. She's empathetic about your condition yet straight to the point: exactly what you need!"